Last Saturday we made it down to Barnsdall Park to catch Beyond Eden. I came from a wedding so that's why I'm wearing a tie and sweater vest in the photos - ha ha. Last year's East of Eden, which I was a part of, was super fun and exciting, but this year's the galleries and artists turned it up with some really amazing works and notable standouts. Anyhow, here are some pictures. Text by Michael C. Hsiung and some photographs provided by good ole Taylor Brittenham. Beyond Eden showcased the works of over 15 galleries and was held inside the beautiful confines of the historic Los Angeles Municipal Art Gallery during the weekend of October 9th, 10th and 11th, with an opening night celebration planned for Saturday, October 10th. Participating galleries include Billy Shire Fine Arts, Black Maria Gallery, Carmichael Gallery of Contemporary Art, Copro Gallery, Crewest, DRKRM, Gallery 1988, Gallery Nucleus, La Luz De Jesus, Los Angeles Municipal Art Gallery (LAMAG),LeBasse Projects, Subliminal Projects, Synchronicity Space and Thinkspace. Check out the gallery map here. Title Wall at Beyond Eden at Barnsdall Park. 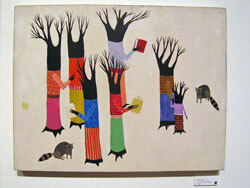 Following artwork by Deedee Cheriel from Subliminal Projects. I really liked her works and I think they were definitely a standout that evening. Tall Geisha lady on stilts. Credit card guillotine. Audiences to guillotinings told numerous stories of blinking eyelids, speaking, moving eyes, movement of the mouth, even an expression of "unequivocal indignation" on the face of the decapitated Charlotte Corday when her cheek was slapped. (Wikipedia). Robert and Lola checking out Know Hope's works from the Carmichael Gallery of Contemporary Art. Artwork by Jason Hernandez from Black Maria Gallery. Amazing turnable works by Paul Chatem from Black Maria Gallery. One of my favorites - Ken Garduno from Black Maria Gallery. Jason Hernandez by his works. Artist Sam Saghatelian by his works from Black Maria Gallery. My apologies for the following works with no artist information. Loved that painting on top of the doorframe. Mondo Gronk (Top Left), Louis Jacinto (bottom Left) from DRKRM Gallery. David from the Carmichael Gallery is a nice fellow. Caption 18 - Know Hope from Carmichael Gallery. I'm a real big fan of this guy's stuff. Thomas Doyle from LeBasse Projects. Artwork by Nate Frizzell from Lebasse Projects. Artwork by Morgan Slade, Acansi! from Billy Shire Fine Arts. Here's a mural room done by artist Ekundayo (Thinkspace). Heroes & Villains" photographic exhibit from Tatiana Wills and Roman Cho. Portrait of Travis Millard from Heroes & Villains" photographic exhibit from Tatiana Wills and Roman Cho. Portrait of Mel Kadel from Heroes & Villains" photographic exhibit from Tatiana Wills and Roman Cho. Portrait of Saelee Oh from Heroes & Villains" photographic exhibit from Tatiana Wills and Roman Cho. Portrait of Dave Kinsey from Heroes & Villains" photographic exhibit from Tatiana Wills and Roman Cho. Please throw in there a Ken Garduno. Phil, Robert, Me, Jason Hernandez, and Saul Gonzalez.